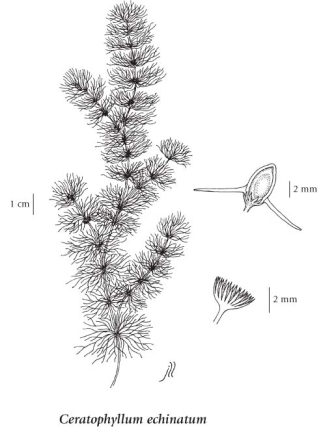 Spineless hornwort is a perennial floating aquatic species endemic to North America where it is found primarily in the eastern part of the continent and then is disjunct in British Columbia, Washington and Oregon (USDA 2011). In British Columbia, it is found primarily in the southwestern part of the province, in lakes and sloughs in the lowland and montane zones. This species has coarse branching stems and usually no roots. Leaves are forked and arranged in whorls, and are sometimes toothed. Species in this genus are distinctively stiff to touch, and retain their shape when pulled from the water--aiding in identification of the genus. In writing about the rare plants of the Fraser Valley, Lomer (2011) says: "An aquatic plant much like the common C. demersum, but more slender. It tends to grow in clearer, more acidic bog water than the latter species. [In the Fraser Valley], it has been found at Devil's Lake, west of Hope (Ceska 1978, unpublished), and I expect that further collecting will prove that this species is not rare in southwest BC, though there appear to be very few sites in the Fraser Valley." A complete species description is given in Flora North America. Aquatic herb, usually without roots; stems freely branching, 0.3-4.0 m long. Stem leaves submerged, in whorls of 5-12, 2-4 times forked into linear or threadlike segments, these usually entire or sometimes finely toothed. Inflorescence of solitary, minute, axillary flowers; petals lacking; sepals 3-15, sometimes petal-like; stamens 12-16. Achenes usually lacking, if present then much flattened, 5-7 mm long, ellipsoid, wing-margined with several lateral spines. Lakes and sloughs in the lowland and montane zones; locally frequent on S Vancouver Island and the Gulf Islands, rare in the lower Fraser Valley and along the Alaska Highway; E to MI and ME and S to FL and MX. This species is cold-water tolerant and is reported to overwinter under ice. It is often grown in aquatic gardens.